Just because it's so entertaining and colourful. Looking at these dogs eating ice cream is the best possible way to start your day! It's summertime folks, get some cool! If you want to make some ice cream for your dog yourself, we have a good recipe for you. Slice the banana and put it in a bowl together with the yoghurt and the peanut butter. Make sure you create smooth mash out of it. Put the mash in small plastic cups (about 0.2 CL) and leave a hole in the bottom for the dog cookie (cause that doesn't go into the freezer). Put them in the freezer for 2 hours and voila! 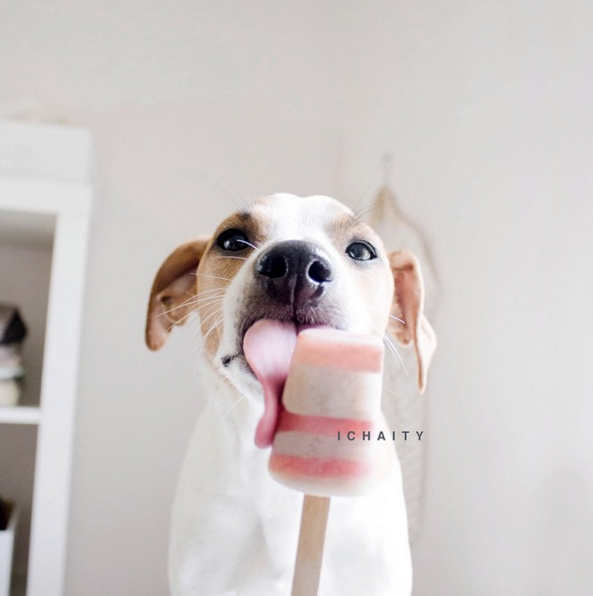 A healthy and great-tasting ice lolly for your dog (or for you, just don't eat the dog cookie).